Argentinian sociologist Marco Teruggi described Guaidó in the same article as “a character that has been created for this circumstance” of regime change. 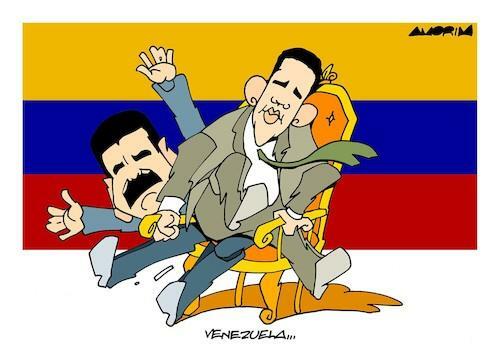 Here, his constitutional credentials to be interim president of Venezuela are deconstructed. To make a short story shorter, US Vice President Pence phoned Guaidó on the evening of January 22rd and presumably asked him how’d he like to be made president of Venezuela. The next day, Guaidó announced that he considered himself president of Venezuela, followed within minutes by US President Trump confirming the self-appointment. A few weeks before on January 5, Guaidó had been installed as president of Venezuela’s National Assembly, their unicameral legislature. He had been elected to the assembly from a coastal district with 26% of the vote. It was his party’s turn for the presidency of the body, and he was hand-picked for the position. Guaidó, even within his own party, was not in the top leadership. The function of adjudicating the validity of an election, as in any country, is to be dealt with through court challenges, not by turning to Donald Trump for his approval. And certainly not by anointing an individual from a party that could have run in the 2018 election but decided to boycott.